I first saw Trevor Noah on a Netflix comedy special called “Afraid of the Dark.” I found him hilarious and original. He is from South Africa and has an outsider’s perspective about race, which is intriguing and identifiable. After reading “Born a Crime,” I understand the background of his jokes a lot better. Trevor Noah grew up in the social economic chaos of the time during the fall of apartheid and the leadership of Nelson Mandela. Noah talks about his childhood and how he was personally affected by the racial and economic stereotypes of the time. His language flows easily and his story arcs are precise and hilarious. I enjoy imagining some of the shenanigans that went on in his life. However, he is also able to make a big statement about language, race and social issues because he has lived on the short end of almost all of them at some point. 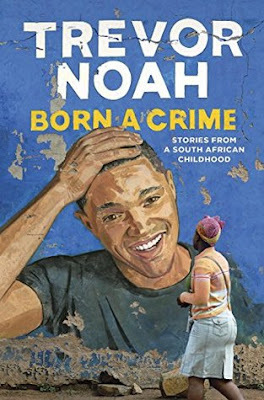 I enjoyed reading “Born a Crime” after watching his standup special because Trevor Noah is a terrific impressionist. As I read, I could imagine him voicing Nelson Mandela, his God-fearing mother, or even his dancer friend named Hitler. Even if you’d never heard Noah’s added inflections, his writing speaks for itself as a descriptive and entertaining autobiography. I greatly enjoyed his humorous commentary on race, abusive relationships and the challenges about growing up in South Africa during the overturn of a great power. Amanda, I've been wanting to read this book, so I appreciate your review. Thank you! Thanks for reviewing this book. It sounds like a must read. Nice! We see his stand-up comedy a lot on South African TV. I'm proud of him that racial stigma hasn't stopped him from doing great things. 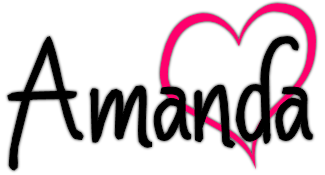 Thanks for linking on Amanda's Books and More!